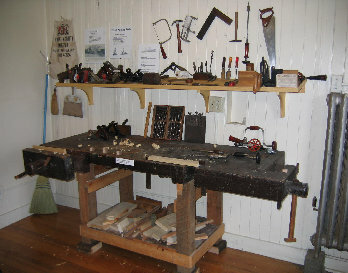 Guided and supervised by museum staff, adult visitors to our Open Houses (and adolescents accompanied by an adult) can try their hand at both our woodworkers’ bench and a re-created Goodell Pratt machine shop in our Hands-on Workshop down the hall from the exhibit gallery. While the Workshop is only in action for Open Houses, Teacher Workshops, Special Interest Tours, and by chance on Summer Sundays, it is always open for viewing during the museum’s open hours. Click here or on the Shirts image below to order yours now! In Time for Spring! Get your Museum T-Shirt Apparel here! Explore this Superview of the way it looked before 1937! 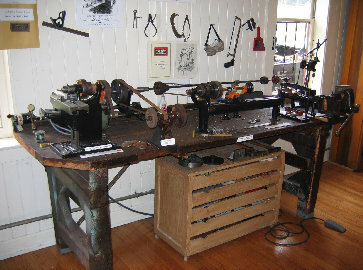 Learn about this tool made here, in our building! Greenfield's Car! Read about the Oakman Motor Carriage from a eye witness! Wiley & Russell - 1897 Computer animation based on photos and insurance maps. Explore the Walker Atlas of Greenfield - 1884 Zoom into finest detail!